I took a little time out yesterday to clean up my latest acquisitions, a pair of neglected Bridgestones I wrote about in my last post. Every time I mention the name 'Bridgestone' to friends, it is met with a confused look or cocked eyebrow. In light of this, I will clarify a few things about the origins of the marque. 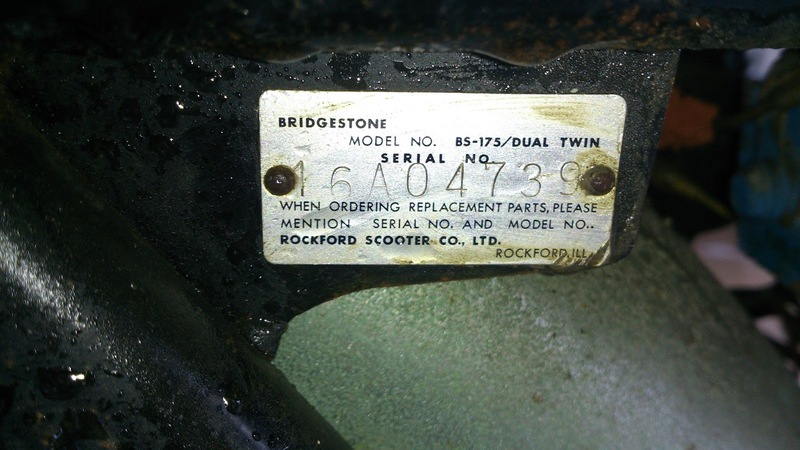 Bridgestone motorcycles were produced in Japan between 1953 and 1971 and distributed in North America by the Rockford corporation of Illinois. This is the same company that produces tires that many of us use today on our cars and motorcycles. Bridgestone offered high performance two strokes with innovative features (more on that later) for a very fair price. What happened to the bikes you ask? Rumor (or legend) has it that the big four (Honda, Yamaha, Suzuki and Kawasaki) made it clear that if Bridgestone continued to compete for bike sales, it might be time to find another tire supplier. 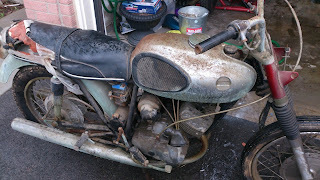 Anyway, on with the relics in my garage! It seems that the power washer was not enough to strip away all the filth on the larger one, but the little one came out just fine. Whenever I take on something like this I generally seek a group of experienced enthusiasts who can offer advice, guidance and sources for parts. I was lucky enough to find http://bridgestonemotorcycleparts.com and was offered membership to their forum. 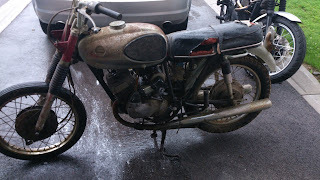 The wonderful thing about obscure marques, be it car or motorcycle is they tend to draw a small but dedicated fan base. The site is run by a fellow named Richard who has a plethora of NOS parts and is reachable by phone or email. He has parts manuals, factory manuals, vintage ads, magazine articles and more all posted for download (for free I might add) on the site to members. I presented the pictures of this little beast to the group, the initial impression is that it may be a 90 Sport deluxe, however it seems to have parts from other models that may or may not have been dealer installed. The serial number was too hard to read, I will need to remove the tank and sand the area around the stamping and spray with WD40. That will usually make it easier to read. 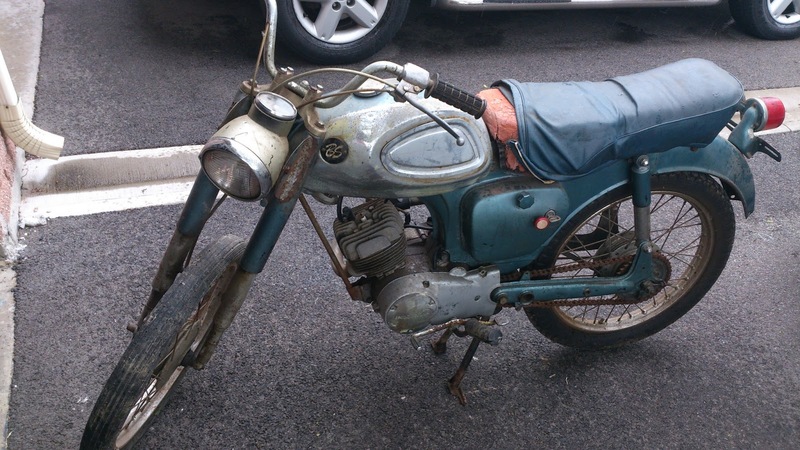 This one is a 175cc Dual Twin, produced in January of 1966. 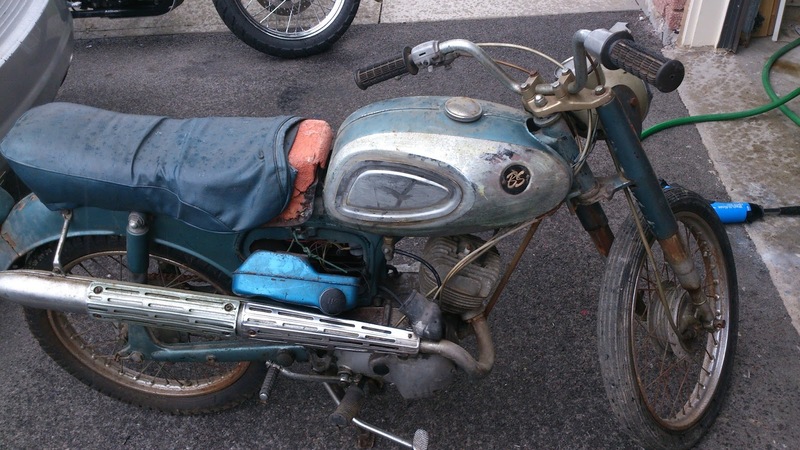 There was also a very neat Scrambler version with high pipes with the name 'Hurricane'. With the styling, it could have blended easily into a Gerry Anderson program like Captain Scarlet or perhaps Thunderbirds. This is definitely the rougher one, but I have decided to tackle it first. The primary reason is the fact that I now have a lovely wife at home who has never ridden before. Having her to start on a 750cc Triumph twin is probably a very poor idea. This is a good height for her, she can pick it up if need be and the power won't be too off putting. Considering the very low cost of NOS spares and the easy availability, this budget build should not take as long as some of my other projects. Both bikes turn freely and have decent compression, The fuel tank is decent and very clean, although the chrome is shot. My plan is sandblast and powder coat. Here is a quick list of what I know I will need. 10. Handlebars and likely controls. My goal? To do this up for a total budget of $1500.00.